Vimeo; the land of artistic videos. This video has so much story and so much art, both in video and physical form. Another joint venture video from Dorian. I can’t help but think of Atari when looking at the completed joint. It would also make an interesting detail for adding a workbench end cap piece. Do you prefer Western or Eastern style hand tools? Push or pull? I prefer Western saws but still find value in keeping a pull saw in the arsenal. I might pick up one of these inexpensive Japanese planes and have a go at it. I found this video while researching Hovarter vises. They are interesting quick release vises but I wanted to share this video specifically for the mobile base setup. Interesting workbench. A good, sturdy lathe cabinet. Built to last forever. I really like how the drawer pulls turned out. The whole piece has a really modern industrial look that works well in this design. 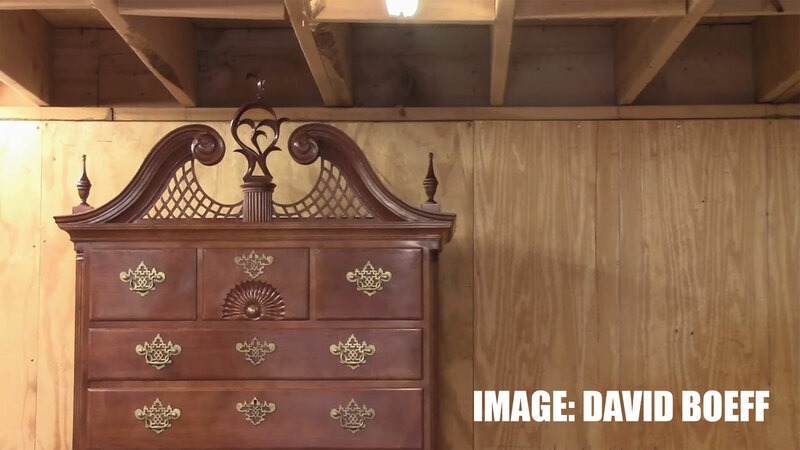 David a period 18th century furniture maker who’s not only making crazy beautiful pieces of furniture but he’s sharing his process through his videos. His videos don’t contain any fancy editing (I say that respectfully) and instead just focus on time spent making furniture. If you’re into high-end furniture and enjoy the “shop work” style of videos be sure to subscribe to his channel and check out his previous projects. Nothing but quality work. I’ve previously shared videos of his specifically to show his top side table saw dust collection. This is a video all about the setup and he does have plans available. William showing how easy it is to get a very precise setup. 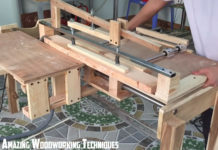 This is by far the best presentation I’ve seen at making a flawless miter sled. Sharpening card scrapers with William Ng. This is the most simple method and explanation of sharpening a card scraper. Don’t overcomplicate it. Super simple. William Ng isn’t “The Wood “Whisperer” (Marc Spagnuolo calls himself that). The card scraper sharpening video is probably good, yet I’ve previously found several excellent vids that teach the proper technique — particularly those by humble experts Matt Cremona and Stumpy Nubbs that are exemplar. I didn’t call William Ng “The Wood Whisperer.” Each bold heading shows the name of the YouTube channel where the video was uploaded. Then I add a subscription link to each video where the video was uploaded. 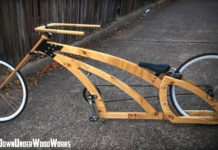 “The Wood Whisperer” Marc Spagnuolo recorded the video and uploaded it on his channel. 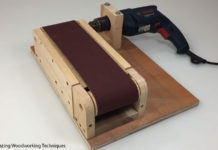 The card scraper video from Marc, featuring William Ng, was uploaded on April 2, 2011. Long before the scraper videos of Matt and Stumpy. Thank you Jay for the Shout Out regarding the Lathe Cabinet – very much appreciated!! Kind Regards, Scott Turner. P.S. Love your work and contributions! Did I miss something about these not coming out anymore? Hope not. Really like seeing others’ work in this manner.